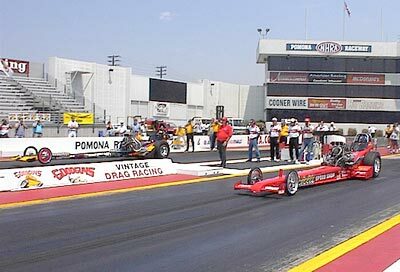 Team WW2 entered the Goodguys 5th West Coast Hot Rod Happenin' with high hopes -- ready to race after a 2+ month layoff. As the press release will attest to, things didn't go according to plans this time. Round one of qualifying saw Jim Murphy paired with Shep Ginzburg. The (adjusted) altitude was high and the WW2 car was down on power... shaking their brand new M&H tires. The run was only good for the #9 qualifying spot which is not where Murphy and Team wanted to be. 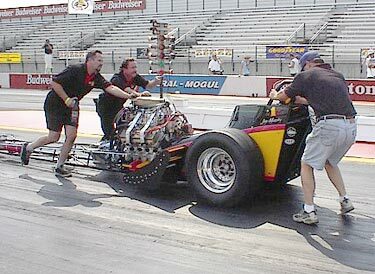 To save weight, the WW2 Top Fuel dragster doesn't use a reverser (as the other cars do) so the crew has to get him back to the line after a burnout the old fashioned way. Murphy heats up the tires prior to his second qualifying attempt. On their second and last shot at qualifying, Team WW2 was faced with a nice big oil slick in front of us (cleaned up but leaving a marginal track). They got down through the first part of the track fine and actually had good 60' and 330' times (1.11 and a 2.82). But then Jim hit that grease sweep and it was just spinnin' 'em to beat the band. 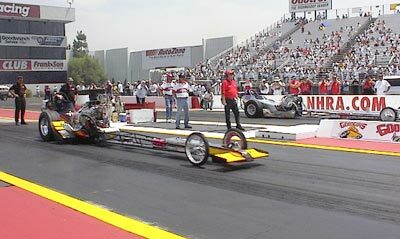 He was in and out of the throttle, holding the brake the whole way and managed to get it to the other end with an impressive 6.30 at 222 mph. 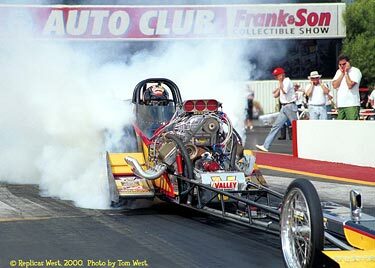 This was good for the #5 qualifying spot that would pit Murphy against the Gotelli Speed Shop car come race day. 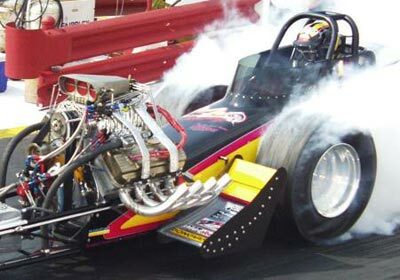 Knowing they would have to step up the cars performance to beat Larry Gotelli in Round 1 Sunday, the Team installed a new blower and made other performance adjustments that proved to be too much for the track. Shortly after this photo was taken the WW2 car started smoking the tires and the race was over. As usual, Murphy blamed himself for the loss. The sign of a classy and confident driver. "I made the wrong decision. 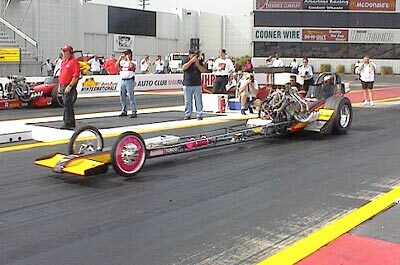 I knew Larry was going to run good. i knew we weren't going to go out there and run 6.20 and beat him, I felt."